When it comes to research and academic projects, planning is everything. Whether you are constructing a new building or performing phased, occupied renovation work, you need a strategy that allows operations to continue while keeping students, faculty, workers, and the public safe. We have experience with all types of research and academic clients, ranging from public and private elementary, middle and high schools, to colleges and university campuses. This 77,000 square foot mixed-use facility includes rapid prototyping maker space, a group project area, a robotics area, a business incubator, Great Problem Solving Seminar Classrooms, and residential life. Located directly off the main quad, the building is 5 stories with construction costs of $38,000,000. With an active academic campus environment, we relocated locker rooms, and installed a temporary access road for new construction. 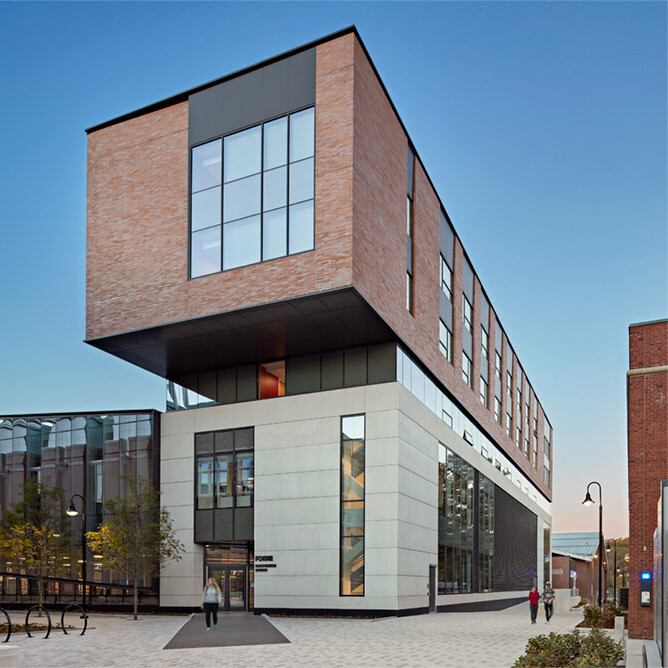 Completed in 2014, this 16-story facility is in the heart of Berklee’s urban campus. The building provides housing for 330 students and has a three-level food service facility, which seats 400 and doubles as a coffee-house performance venue. There is also a small fitness center, three ensemble rooms, and twenty modular music practice rooms. Below grade are two levels of state-of-the-art recording and music technology studios. Located on a zero-lot-line 13,200 square foot site, the below grade construction was particularly challenging, with 36- to 40-foot depths and foundation walls as close as five feet from adjacent buildings. KVA provided Owner’s Project Management services to the Town of Duxbury for the new construction of a 332,105-square-foot, 1,735 student, co-located model high/middle school. The construction was immediately adjacent to the existing middle school, elementary school, wetlands, and connected into an existing performing arts center. The school opened in August 2014, and site improvements, including parking and ballfields, were completed in Spring 2016.